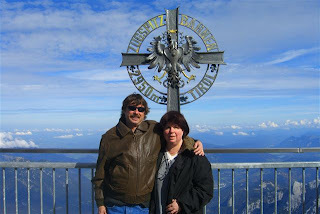 The next part of our adventure took us to the highest mountain in the Bavarian Alps. 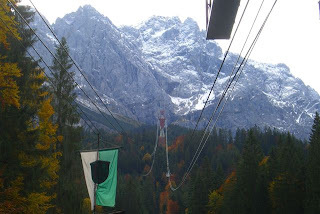 The Zugspitze is 2,962 meters (9,718 feet) high. To get to the top we took a gondola all the way to the top. At the top is also the border between Germany and Austria. This picture is Ron and I on the Austrian side (Tirol). It was snowy and cold up there but we warmed up with some great wheat beer and french fries! The views at the top were amazing and indeed it feels like you're on the top of the world. The ride up to the top was a little scary, but it was really smooth. The platform at the top is also used for scientific purposes and does major research in the field of air quality and pollution. We returned last Wednesday from our much needed vacation in Germany. What a great time we had. We traveled with our great friends Rich and Julia (on the left of the photo). 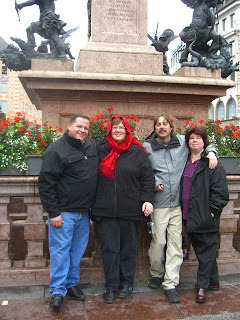 After our flight from Portland to Frankfurt and a short stay overnight, we took the high speed train to Munich where we were able to take in the last couple of days of the Oktoberfest. We didn't take any pictures at the fest, because frankly, what happens at Oktoberfest should stay at Oktoberfest!! If you've ever been to any Oktoberfest in the states, it doesn't even compare. Munich really knows how to throw a party. After a few days it was time to pick up our rental car and head to southern Bavaria. Our first stop was at the very charming Scholderhof Farmstay . The location was perfect for day trips to the castles and many charming Bavarian towns. 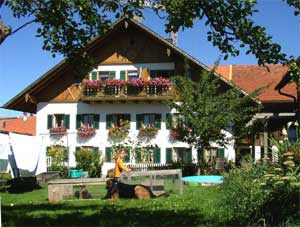 Scholderhof Farmstay is also locatged next to Wieskirche which is on the UNESCO World Heritage list. 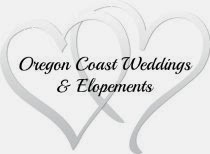 We had a 2 bedroom apartment that had beautiful hand carved woodwork. For breakfast, there were farm fresh eggs, sliced meats, wonderful grain breads and delicious German cheeses. This type of breakfast is what you get at most hotels, bed and breakfasts and farmstays. No, it's not the kind of breakfast we serve at Sandlake Country Inn, but it's definitely a good way to start your day. 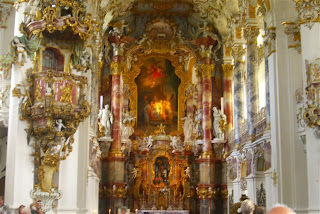 Wieskirche is a very unasuming looking building from the outside, but once you enter, you're in another world. This little Rococo gem was built in the mid 1700s and is a pilgramage church. 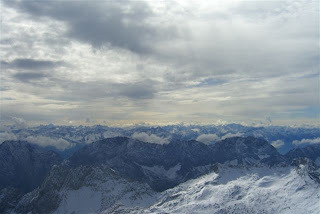 My next post will share with you our trip to the top of the tallest mountain in the Bavarian Alps! Stay tuned!